Google has released version 1.0.154.46 of it’s browser Chrome which plugs security holes as well as some issues with the browser. Fix bad same-origin check that could lead to one frame being able to read or write the location of other frames. Filter out Set-Cookie responses in XMLHttpRequest responses. Add support for UA spoofing, and spoof Safari’s UA string when loading URLs from *.mail.live.com (to fix Hotmail). Fix pages failing to load with ‘waiting for cache…’ message. Fix ability to send mail with Yahoo! Mail. Mark the SECOM Trust root certificates for EV. Fix to not download outdated SafeBrowsing lists. Fix some pop-ups that were blocked even when the user requested them. Fix a timing issue that prevented Gears from starting properly sometimes. You can also check out the detailed release notes & download the latest version on the Google website. 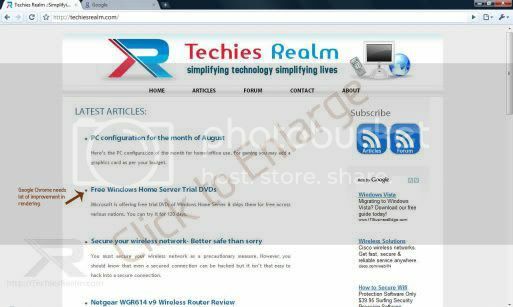 Techies Realm along with Avira bring AntiVir Premium in an exclusive promotional offer for Techies Realm readers so that you can have a virus & spyware free experience. Avira AntiVir Premium ensures zero trouble computing by securing your computer from all threats from viruses, worms, trojans, rootkits, phishings, adware, spyware, bots, and dangerous “drive-by” downloads. Avira AntiVir Premium has best detection rates and top-class security with several updates every day. During this promotional offer you can use Avira AntiVir Premium for 3 months free of cost! 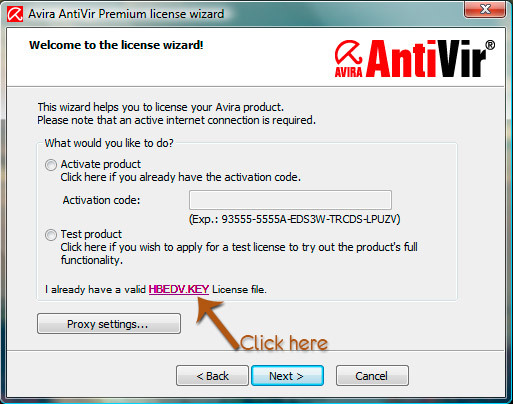 You can get the license key from Avira Online Shop for Techies Realm. After registration you can download the license file from the site. The license key will also be emailed to you. Google released Chrome, an internet browser, recently. The web & twitter is going crazy over Google’s latest offering. Here’s what you must be thinking- Should you ditch Firefox for Chrome? That needs to be answered with facts & tests. So here I am with a small review of Google Chrome. To download Google Chrome click here. After clicking the download button on the website you’ll be downloading a 475 KB file. After the download completes, execute that file. Now it will download the main installation files. Why does Google wants us to download two files? Tabbed browsing- Nothing new in this. Tabbed browsing is available in Opera, Firefox, Internet Explorer and Safari. Application shortcuts- You can create shortcuts to websites or websites offering services like email. The shortcut is then created on desktop/start menu/quick launch bar. When you open the shortcut the website is opened with maximum space without the usual bars & tabs. It gives you the feeling like you are using an application instead of browsing the web. Pretty cool! Independent tabs- The whole browser won’t crash in case one of the tab hangs or crashes. You can simply close that misbehaving tab from task manager. 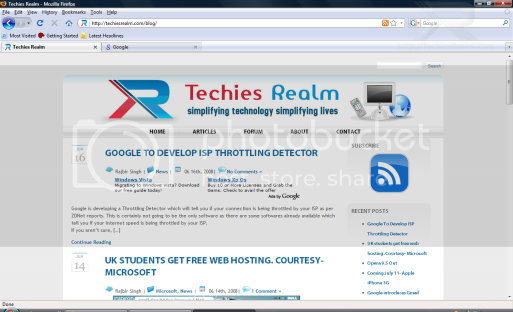 Expect this feature in Internet Explorer 8 too. Incognito mode- It’s similar to Private Browsing in Safari. The pages you view are not saved in history and cache. Cookies, form information and passwords are not saved as well. 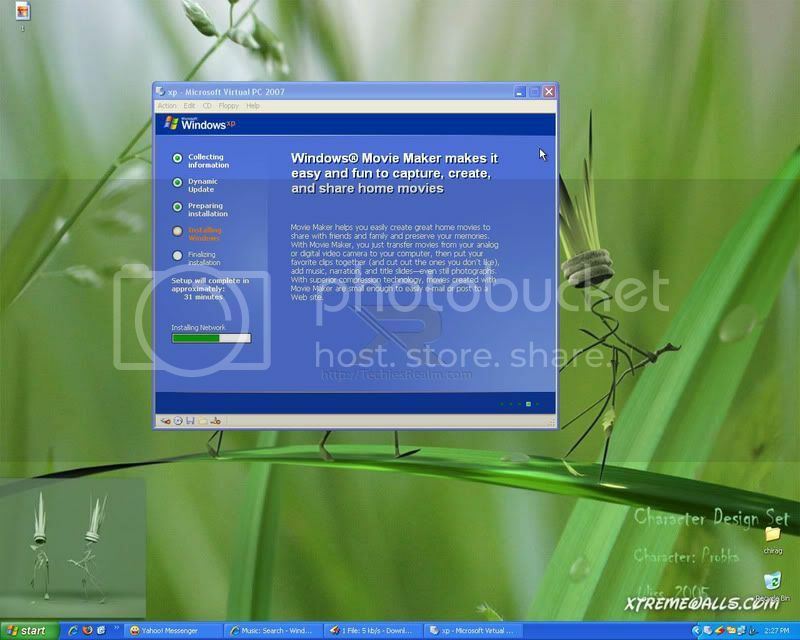 Internet Explorer 8 Beta 2 also has a mode called InPrivate similar to Incognito mode. This, once again, is nothing revolutionary. Safety- There is no innovation here too. It’s pretty similar to Firefox 3 , Opera 9.5 & Internet Explorer 7+. Address Bar- It’s similar to both Firefox and Internet Explorer 8 Beta. Nothing much to say about it. Snappy- It loads pretty fast. You’ll feel like you clicked the icon & it opened at once. Memory usage- It uses very less memory compared to Firefox. Status bar- It’s pretty different & is smaller in size from other browsers. It appears only when the page is loading but then Opera’s status bar can also be set like that. Interface- Interface, like other Google products, is very simple & easy to understand. It doesn’t take much time to get used to this browser. No close confirmation- When multiple tabs are open & you hit the close buton (X) on the right, it doesn’t ask if you want to close all the open tabs. I accidentally closed the window twice & lost the work I was doing. No addons- Firefox addons addict will not be satisfied with Chrome as they want control over everything. No RSS support- It does not support RSS feeds. Yes you read it right! Status bar- Okay, status bar comes both in good and bad categories. The bad is there is no progress bar hence you don’t know how much data is left. 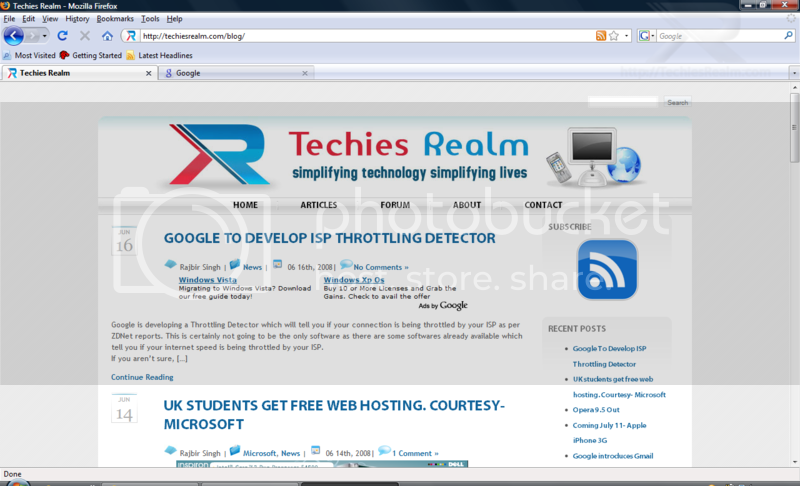 In the screenshots you can clearly see the difference between the rendered output of Chrome & Firefox 3. You can also try Internet Explorer, Opera or Safari and will see the difference between them & Chrome. Google Chrome is still in beta and it looks promising. But as of now it’s not much of a competition to other browsers. So stick with your browser which ever you are using at the moment but do give Chrome a try as it’s worth trying. Mozilla, on June 17, released Firefox 3. 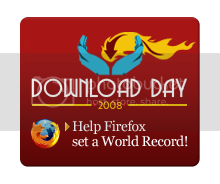 Mozilla had created much hype with it’s release by ‘urging’ users to download it on the Download day- i.e. June 17, to create a new world record, the move which has been widely criticised by many. Why do they want to ‘force’ us to download it? Users will download it without any request if it’s worth downloading. Has Opera Software insisted it’s users to download Opera 9.5? Well, anyway now let’s move on to the browser & it’s new features. New UI- Firefox 3 now sports new User Interface (UI) which is platform native. Whether you use Windows XP/ Windows Vista/ Mac/ Linux you get the native look & feel which feels like home. Safer- The new Firefox now has Instant Website ID feature which tells you if the website can be trusted or not. All you need to do is click on the website icon known as favicon on the address bar. Eg. 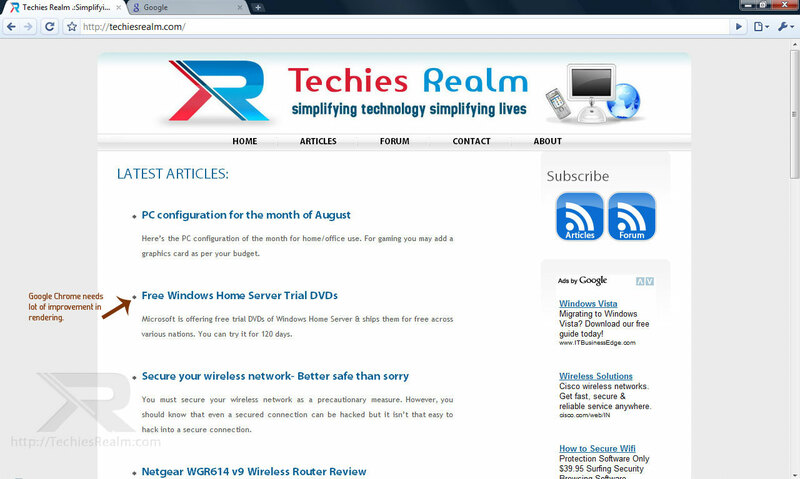 Techies Realm has TR favicon which is showed next to the site address on the address bar. This version also has malware protection. You’ll receive a warning if you visit a attack website. New address bar- Firefox 3 sports a new Smart Location Bar which shows you the websites you visited by it’s content. If you’ve forgotten the website address but vaguely remember it’s content, just type the content & Firefox displays suggestions. Better Standard Support- Firefox 3 claims to be more Web standards friendly, supports new advanced web technologies & colour profiles support for photographers. Virtualization is a proven software technology that is rapidly transforming the IT landscape and fundamentally changing the way that people compute. Today’s powerful x86 computer hardware was originally designed to run only a single operating system and a single application, but virtualization breaks that bond, making it possible to run multiple operating systems and multiple applications on the same computer at the same time, increasing the utilization and flexibility of hardware. In essence, virtualization lets you transform hardware into software. Use software such as VMware ESX to transform or “virtualize” the hardware resources of an x86-based computer—including the CPU, RAM, hard disk and network controller—to create a fully functional virtual machine that can run its own operating system and applications just like a “real” computer. Multiple virtual machines share hardware resources without interfering with each other so that you can safely run several operating systems and applications at the same time on a single computer. Server Consolidation and Infrastructure Optimization: Virtualization makes it possible to achieve significantly higher resource utilization by pooling common infrastructure resources and breaking the legacy “one application to one server” model. Physical Infrastructure Cost Reduction: With virtualization, you can reduce the number of servers and related IT hardware in the data center. This leads to reductions in real estate, power and cooling requirements, resulting in significantly lower IT costs. Improved Operational Flexibility & Responsiveness: Virtualization offers a new way of managing IT infrastructure and can help IT administrators spend less time on repetitive tasks such as provisioning, configuration, monitoring and maintenance. Increased Application Availability & Improved Business Continuity: Eliminate planned downtime and recover quickly from unplanned outages with the ability to securely backup and migrate entire virtual environments with no interruption in service. A virtual machine is a tightly isolated software container that can run its own operating systems and applications as if it were a physical computer. 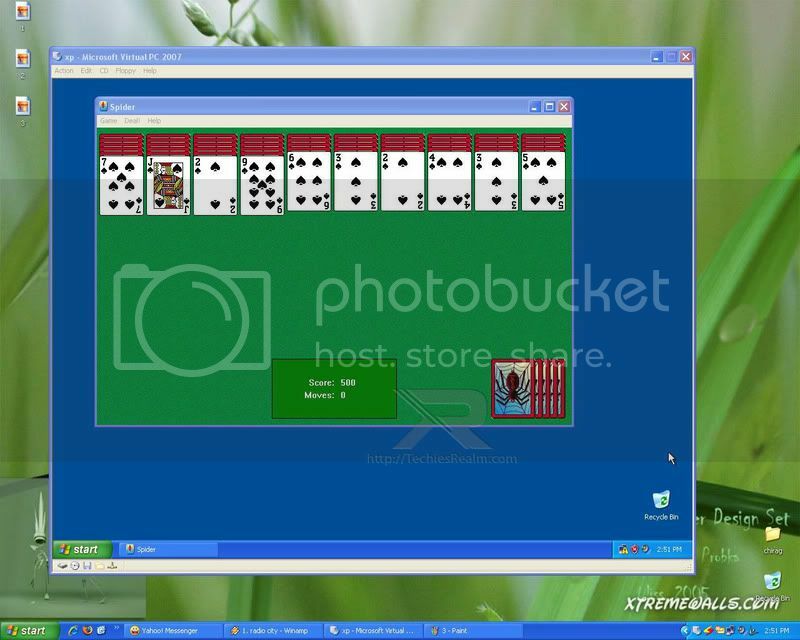 A virtual machine behaves exactly like a physical computer and contains it own virtual (i.e. software-based) CPU, RAM hard disk and network interface card (NIC). What is a Virtual Infrastructure? In essence, a virtual infrastructure is a dynamic mapping of physical resources to business needs. While a virtual machine represents the physical resources of a single computer, a virtual infrastructure represents the physical resources of the entire IT environment, aggregating x86 computers and their attached network and storage into a unified pool of IT resources. Single-node hypervisors to enable full virtualization of each x86 computer. A set of virtualization-based distributed system infrastructure services such as resource management to optimize available resources among virtual machines. Automation solutions that provide special capabilities to optimize a particular IT process such as provisioning or disaster recovery.